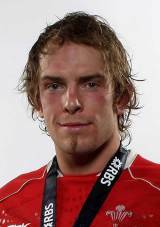 Wales lock Alun-Wyn Jones exhibits all of the attributes for a world class lock, at 6'6" and over 18 stone he is hugely powerful, but also athletic and immensely passionate. His class was apparent from the off and his international debut in 2006 came soon after he had first played a club level and by 2007 he was an ever-present in the Six Nations side, being retained for the World Cup. He was then selected by new Wales coach Warren Gatland in the second row for the 2008 Six Nations game with England and after injury returned to help Wales land the Grand Slam. During the tournament Jones was selected as Wales captain for their trip to Rome. Selected for the 2009 Lions tour of South Africa and made the XV for the first Test defeat in Durban. He was dropped to the bench after the first Test defeat and made two replacement appearances in the remaining Tests. In 2010 he was retained in the squad for the Six Nations but arguably cost Wales their opening game against England at Twickenham by being sin-binned for a blatant trip on Dylan Hartley, with the hosts scored 17 points during his time off the field. It was one glitch and he continued to go from strength to strength. Deciding to remain in Wales despite offers from elsewhere, he was a key member of the side that finished third at the 2011 World Cup but injury hampered the rest of his season although he did play some part in the 2012 Grand Slam-winning side starting their final two matches against Italy and France. And a year later he again returned from injury for the latter stages of Wales' Six Nations campaign, helping them with the championship again. His return to fitness and form was perfectly timed as he was named in Gatland's British & Irish Lions squad, leading the side in the final Test after Wales team-mate Sam Warburton was ruled out. He put in a massive performance in Sydney, helping the Lions claim their first series victory since 1997.